Day Trip to the "Painted Churches"
First, the Cute Baby Pic! 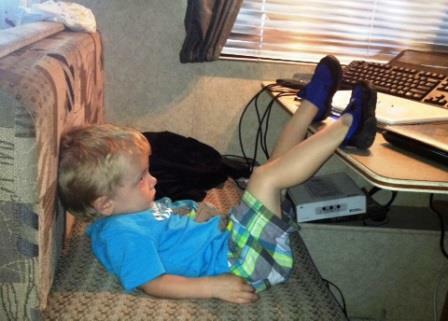 DGS kickin' back watching Disney Movies! 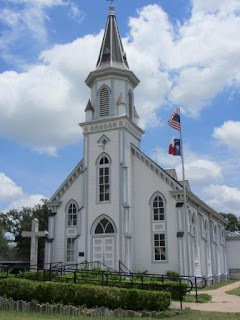 We recently found out about a day trip opportunity about an hour west of us near Schulenburg, TX (also not far from Shiner, TX) that has some beautiful turn of the century Churches that are just breath-taking. They are Catholic churches built by Czech and German immigrants and rival some of the European churches I have seen and so close to home! We decided to go on Memorial Day since we usually drive home to Oklahoma for the holidays but didn't this year. 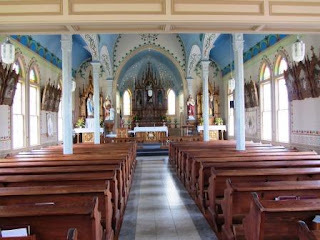 Below are the pictures from the 1st one we went to in Dubina, TX. It is Saints Cyril and Methodius Catholic Church - evidently there are a lot of Czech churches that celebrate Saints Cyril and Methodius! It was built in 1912 (rebuilt on the same site several times) and has more than 3,000 gold leaf stars on the ceiling. It also has colorful angels and vines and flowers throughout. 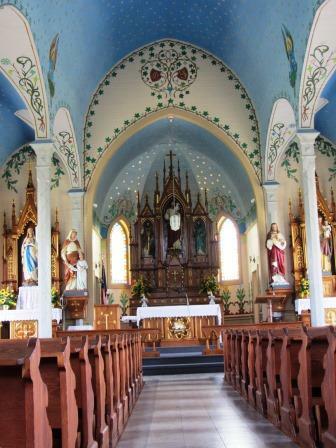 "All of the church’s interior paintings were covered with solid white paint in 1952, but their existence was never forgotten and faint traces remained visible. After over thirty years, the church’s parishioners decided to uncover and restore the paintings in 1983. Thus began a long and tedious restoration process, undertaken each Sunday after church services by the parishioners themselves. 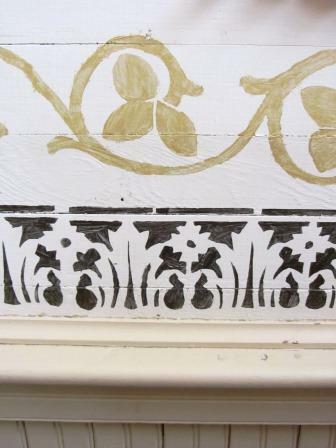 They carefully removed the white paint to reveal portions of the paintings. 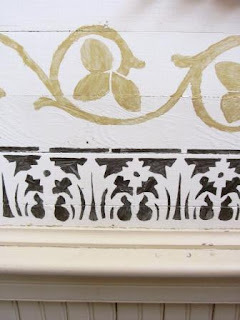 New stencils were made from each original pattern, and the freehand paintings were documented as thoroughly as possible. With the aid of historic photographs, the parishioners then repainted all of the interior decorations in their original locations. Although the recreated paintings lack historic integrity in terms of materials and workmanship, historic photographs reveal the historical accuracy of their design and arrangement." from www.fayettecountryhistory.org. All the "Painted Churches" are free, but have a donation box to help with the upkeep. 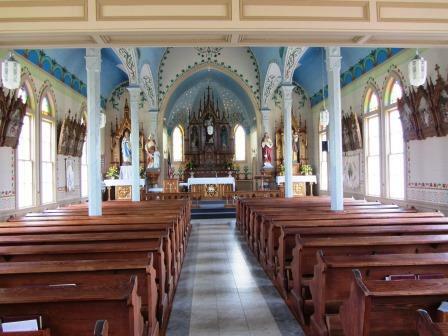 This church was most recently restored in the 1980's by the parishioners as mentioned above. This church can only be viewed from the entryway unless you are with a tour but it is still worth the trip. Here is some detail work in the entry way. All the churches had nearby cemeteries and outdoors Meeting areas where many were have Memorial Day Picnics. It was a beautiful day and a beautiful drive in Hill Country. There were still a few wildflowers but most of the bluebonnets were gone. I would encourage everyone to drive to Fayette County to see these stunning treasures, so many times we think of Eastern Cities or Europe, etc. as having cultural architecture or art but here it is and in Texas! PS - we found out about these from the Texas Highways magazine. I have a co-worker whose wife is expecting a boy and their nursery theme is Jungle, so I found this darling pattern, Swimming Hippo Lovey and crocheted it over the weekend. Too Cute! 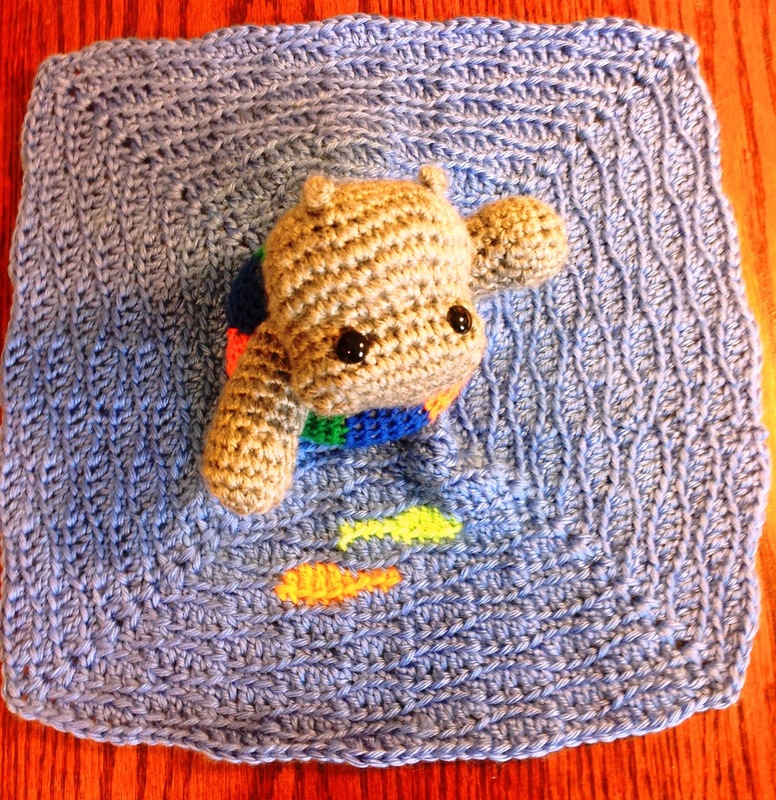 I used Caron Simply Soft for the everything but the swim ring, that is made with Berroco Comfort DK so it is all washable and I used 8mm safety eyes. 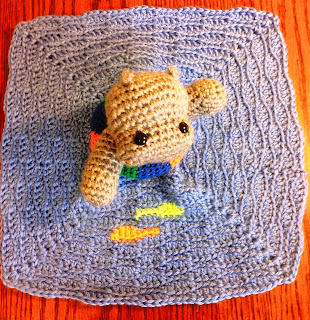 I LOVE the fish in the water...I used C, E, and H hooks but my tension must be a bit tighter than the pattern-writer, so I had to add some extra rows onto the water to make the proportions look right. 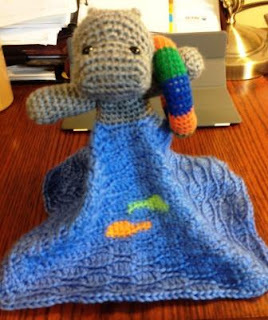 It was very well written except it didn't have any instructions about when to add the stuffing, since this was made in a few pieces, that would have been "good to know". The colors in the first 2 pictures are pretty true. This could be made in a day easily. 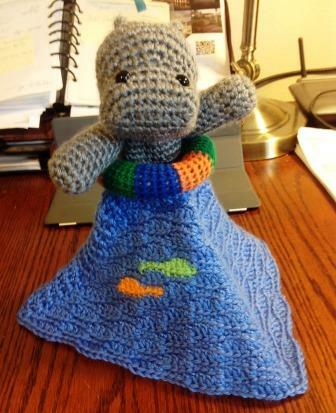 I hope the baby will like his new Lovey!